US President Donald Trump recently criticised the EU for being protectionist, and several political figures in the UK have suggested that Brexit will allow the country to remove protectionist tariffs and regulations to boost trade. But how accurate is this claim in reality? Using data on various aspects of trade, Mark Manger and Atom Vayalinkal argue that the EU is no more protectionist than the United States is, and would rank as one of the most open economies in the world overall. Is the European Union really “very protectionist”, as US President Donald Trump tweeted in July? Would the UK, unshackled from European tariffs and regulations, be able to have much freer trade relations with other partners, most importantly with the United States? After all, the US buys 17 percent of the UK’s exports, making it the second-biggest trade partner after the EU. Australia and Canada have already announced that they stand ready to negotiate free trade agreements with Britain. To answer these questions, we can compare the EU’s trade barriers with those of the proposed future partners. As usual, the picture is much more complex than the rhetoric of proponents of a ‘Hard Brexit’ lets on. Depending on what aspects of trade we look at, it turns out that the EU is no more protectionist than the US, and in fact is one of the most open economies in the world. Looking beyond trade to regulations for services and product markets, important EU member states are much less protectionist than other overseas markets. That doesn’t mean that the UK won’t be able to improve its trade relations with new partners, once the country starts negotiating its own trade agreements. But getting better access than what these countries offer to the European Union would require a herculean effort by the UK and a sudden outbreak of enthusiasm for free trade among these countries. Tariffs – the duties charged on the import of a good – do not matter as much as they used to, thanks to successive rounds of multilateral trade negotiations. Rather than just averaging the import duties, economists often prefer the ‘trade-weighted mean’, whereby the duty is multiplied by the share of a good in the total trade to arrive at a figure that represents the practical relevance of a tariff. This reflects that high tariffs on some products may not matter much if there’s very little trade in the good – although the prohibitive tariffs may themselves of course be the reason for why there is no trade in the first place. We look at both, the simple and the weighted average of tariffs, in the figures below. We show the applied tariffs – the duties actually charged, generally less than what the WTO would permit – for Australia, Canada and the United States, the future partners of the UK’s first proposed trade agreements after Brexit comes into effect, the European Union, and for Japan. All data is from 2015. 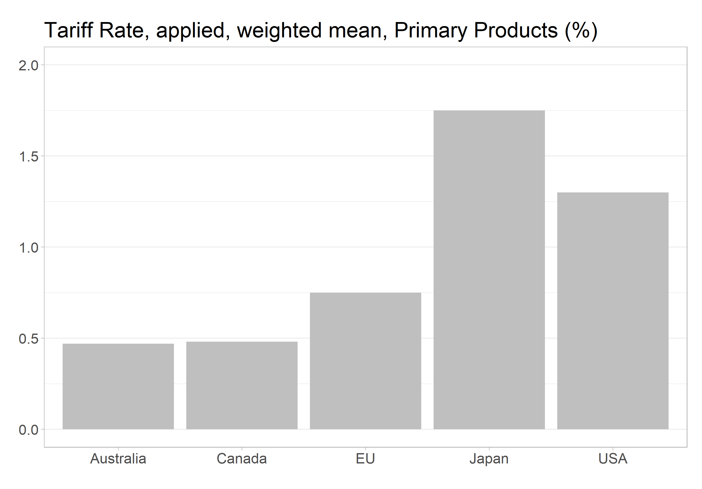 Starting with manufactured products in Figure 1, it is immediately obvious that the European Union is no more protectionist than the US, Canada or Australia. Looking at the weighted mean, Australia is slightly more protectionist and the US slightly less so, but the difference is less than half a percentage point. Taking a simple average, the EU has the second-lowest tariffs after Japan. This simply reflects that countries also have low tariffs on goods that they themselves produce competitively, and the EU and Japan are good at exporting manufactured products to the world. Primary products – mostly agriculture – are often cited as an example of protectionist policies championed by the EU at the behest of France and Italy. But even here, as figure 2 shows, tariffs are extremely low. Japan has the highest tariffs, followed by the US. When we take a simple average, the EU and the US are on par. Naturally, Australia and Canada have lower tariffs because they themselves are competitive exporters of primary products. Unfortunately, tariffs on agricultural goods are not always what they seem: countries often have quotas for specific goods. With these quotas, they sometimes completely disallow any imports so that they can shield local producers from foreign competition. But even here, the EU does not stand out. 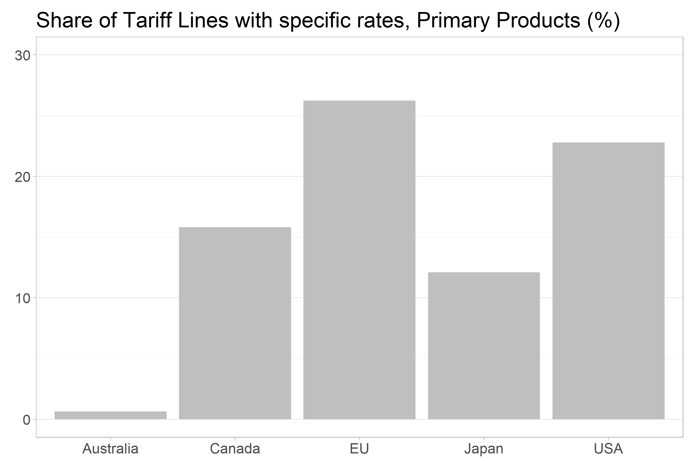 As figure 3 shows, the US has almost the same share of tariff lines (in other words, individual products) on which it charges a ‘specific rate’. Of course, with tariffs already so low, they often have little practical impact. Product market regulations and rules that restrict access for service providers are often much more relevant. Many of these are not in the EU’s ‘competence’ but are set by the member states themselves. We are looking at some of the bigger EU member economies. Again, the data reveals that EU members are no more protectionist than the US, and much less so than Australia and Canada. The Organisation for Economic Co-operation and Development (OECD) has developed indicators that measure the relative restrictiveness of product market regulations, including rules that limit competition. 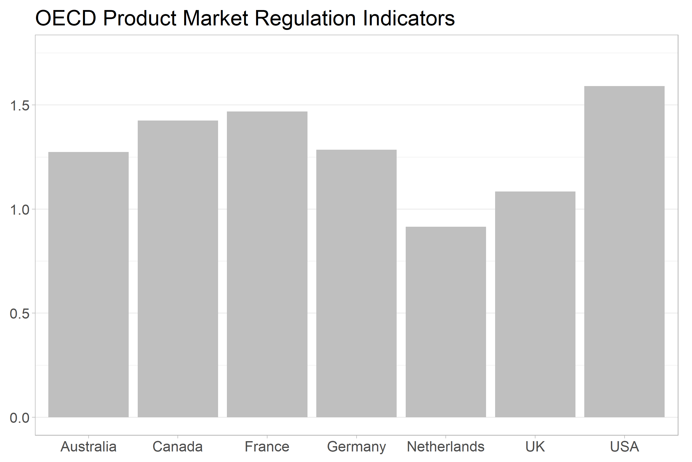 As figure 4 shows, it turns out that the United States imposes more restrictive rules for product markets than, for example, Germany or the UK. Only France and Canada come close. But the UK is by no means the least regulated – the Netherlands have lightened the regulatory burden even more, apparently without being held back by the EU. Because the UK is especially competitive in services, especially professional services that can be supplied across borders, this sector will be of great interest in future trade negotiations. But here again, as figure 5 shows, it turns out the US is not less protectionist than, for example, France, and much more so than the EU members Germany and the Netherlands. Only in professional services does the US offer comparable market access to the very open Australia and Netherlands. Finally, let us consider what economists refer to as ‘revealed openness’ – how much does a country actually trade in relation to the size of its economy? To arrive at this figure, we add exports and imports and divide this figure by gross domestic product. Bigger countries are usually less open, because a lot of trade already takes place within their own borders. The EU’s nominal GDP ($1630bn) and that of the United States ($1800bn) were not very different in 2015. For the EU, we only consider trade with non-members, and we look at the Eurozone separately. As we can see in figure 6 below, the European Union is almost as open as the United States, while the figure for the Eurozone is virtually identical. What does this mean for the UK’s future as a trading nation? First, in the case of a ‘cliff-edge’, hard Brexit that forces the UK to fall back on the WTO to guide its trade relations, it will be challenging to replace the EU with the US. Second, leaving the EU to liberate the UK from its protectionist regulations seems like an overblown argument in the light of the data. Finally, if we assume that Australia, Canada and the United States would still try to protect the same sectors they seek to shelter now, the most direct way for Britain’s trade policy to be much freer than today would be a radical, unilateral liberalisation. From a purely economic point of view, this option offers great gains, but it also creates enormous social dislocations, and it is far from clear that it would find political support in the United Kingdom. Mark Manger is Associate Professor at the Munk School of Global Affairs at the University of Toronto. He is the author of “Investing in Protection: The Politics of Preferential Trade Agreements between North and South” (Cambridge University Press) and of a dozen articles and book chapters on the negotiation and design of trade agreements. He has been a consultant to the Governments of Canada and of Japan on Free Trade Agreements. Atom Vayalinkal is a Research Assistant at the Munk School of Global Affairs at the University of Toronto. You have simply overlooked all of the protectionist measures from a 60% ‘anti dumping” duty on Chinese solar equipment (to protect German manufacturers) to all of the duties imposed to protect European sugar. “the picture is much more complex than the rhetoric of proponents of a ‘Hard Brexit’ lets on”, the objectivity of your article and conclusions becomes suspect. There are no “proponents of a”Hard Brexit” – only Remainers who don’t understand (or pretend not to ?) or believe the rhetoric of other Remainers while refusing to listen to what Leavers actually say. “duty is multiplied by the share of a good in the total trade to arrive at a figure that represents the practical relevance of a tariff”. The graph scale magnifies the results – a tiny 1.1% to 2.3%. Surely this underscores the Leaver point that “cliff edge economic armageddon from new tariffs” is scaremongering nonsense? i.e. Leaving is not as big a deal as frit Remainers would have us believe. …. presumably the definition presumably includes large amounts of zero tariff trade? Otherwise, why is the EU’s 10% tariff on Japanes cars an issue ??? This is an interesting exercise but there are some obvious howlers which throw doubt on the results. 1. Tariffs. In order to assess the protectionist impact of tariffs it is important to look both at the dispersion of tariffs (especially number of tariff peaks) as well as tariff averages. Here the post is misleading on the level of EU agricultural protection which is only a small share of primary product imports (around 20%, and not the majority as the posts states – see http://ec.europa.eu/eurostat/statistics-explained/index.php/Extra-EU_trade_in_primary_goods for the figures). Most EU primary product imports are energy and raw materials including minerals where EU does not generally impose tariffs. Simple average MFN tariffs for food and agricultural products (WTO definition) are around 14% with individual tariff lines up to 100% or more (see WTO Trade Policy Review for the EU). Applied tariffs will be lower because of preferences and FTAs but still high. 2. Specific tariffs refer to non ad valorem tariffs (that is, where tariffs are expressed as an absolute figure rather than in percentage terms) and have nothing to do with Tariff Rate Quotas. 3. While measuring the degree of protection for services is difficult, the OECD measure of the restrictiveness of domestic regulation is not a good measure of protection against third country suppliers. A country may have a lightly-regulated services sector, but if your suppliers cannot get access to it (e.g. because there is no agreement to recognise professional qualifications) it is irrelevant to you as an exporter. Thus, one needs to look at the commitments different countries have made on services in their Schedules of Concessions under the WTO Agreement on Services to gain an understanding of how open markets are to third country suppliers.